Animating a parameter refers to changing its value over time. You do so by setting keyframes (frames at which you explicitly define a value) and allowing Nuke to interpolate the values in between. You can animate most of Nuke’s parameters in this manner. 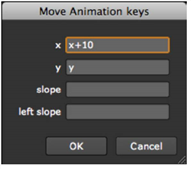 The Animation menu allows you to set key frames, delete keys, and perform other editing operations on the curves for animated parameters. 1. Use a Viewer to navigate to a frame where you want to place a key. 2. Click the animation button next to the parameter you want to animate. 3. Select Set key from the dropdown menu. The parameter’s input field turns blue, indicating that a keyframe has been inserted. Nuke switches to autokey mode: when you change the parameters value at another frame, it automatically inserts another keyframe for you. You can also set a key for all the controls in a node. To do so, right-click on a node's properties panel and select Set key on all knobs. 4. Navigate to the next frame where you want to place a key. 5. Edit the parameter’s value using the input field, regular slider, or color slider. The moment you change the value, Nuke creates a keyframe. 6. Continue adding key frames as necessary. 7. Use the Viewer’s scrubber to preview the result. 1. Use the Viewer’s next edit/keyframe and previous edit/keyframe buttons to navigate to the keyframe that you want to remove. Notice that the scrub bar indicates key frames with a blue mark. 2. Click the animation button . 3. Select Delete key from the dropdown menu. 1. Click the animation button. 2. Select No animation from the dropdown menu. Nuke removes all key frames from the parameter, and sets the static value to match that of the current frame. 1. Create the Tracker node you want to link to. 2. On the Transform tab of the RotoPaint node’s control panel, click on the translate animation menu. 4. Select the Tracker node you want to use in the tracker node dropdown and in the link to dropdown, select whether you want to link to the position of the track or the translate values of it. 5. Select which tracks you want to use by checking the track boxes. The expression fields update with the appropriate expression syntax. 6. Then click OK, and your linking is done. Your Bezier shape’s translate value now changes when the Tracker value is changed. • Repositioning clips refers to changing the position, but not the content or the duration, of the clip. In the Dope Sheet, you can reposition clips using the Read, TimeOffset, and TimeClip nodes. • Trimming clips refers to removing unwanted frames from the head or tail of the clip. In the Dope Sheet, you can trim clips using the Read and TimeClip nodes. • Slipping clips refers to changing the content of the clip that is seen, but not the position or duration. In the Dope Sheet, you can slip clips using the Read and TimeClip nodes. • Setting a frame range for a clip controls which frames a downstream AppendClip node uses from the input, which frames are displayed in the Viewer when the timeline range dropdown menu is set to Input, and which frames are sent to the flipbook. In the Dope Sheet, you can set the frame range for a clip using the FrameRange node. • To reposition a clip, place the cursor over the Read or TimeClip bar in the Dope Sheet and drag left or right. The new start and end frame numbers are displayed on either side of the bar, and the frameoffset control in the Read or TimeClip properties panel is adjusted automatically. TIP: You can also reposition a clip by selecting the bar, double-clicking on the first and last frame numbers next to it, and adjusting them in the x fields that pop up. • To trim a clip, place the cursor in the beginning or end of the bar and drag left or right. The new start or end frame is displayed next to the bar, and an orange line appears to represent the original frame range. The framerange control in the Read or TimeClip properties panel is adjusted automatically. TIP: You can also trim a clip by selecting the bar, double-clicking on the first or last frame number next to it, and adjusting the number in the x field that pops up. TIP: The number of frames you can trim from either end of a clip is constrained by the clip's original frame range. However, if necessary, you can trim beyond the original range by holding Ctrl/Cmd while trimming. • hold - select to show a still picture of the first/last frame of the frame range. • loop - select to start over and keep looping the span of the frame range outside the first/last frame of the frame range. • bounce - select to play the span of the frame range backwards and forwards between the frame range limits. • black - select to display a black frame outside of the first/last frame. • To slip a clip, first trim the clip to create clip handles. Then, place the cursor over the bottom half of the bar and drag left or right. The clip handles move to indicate what portion of the clip is visible. The frame range and frame offset controls in the Read or TimeClip properties panel are adjusted automatically. TIP: The number of frames you can slip a clip by is constrained by the clip's original frame range. However, if necessary, you can slip beyond the original range by holding Ctrl/Cmd while slipping. To reposition a clip, place the cursor over the TimeOffset bar in the Dope Sheet and drag left or right. The new start and end frame numbers are displayed on either side of the bar, and the time offset (frames) control in the TimeOffset properties panel is adjusted automatically. • To set both the first and the last frame for a clip, place the cursor over the FrameRange bar in the Dope Sheet and drag left or right. The new start and end frame numbers are displayed on either side of the bar, and the frame range control in the FrameRange properties panel is adjusted automatically. • To set only the first or the last frame for a clip, place the cursor in the beginning or end of the bar and drag left or right. The new start or end frame is displayed next to the bar, and the frame range control in the FrameRange properties panel is adjusted automatically. TIP: You can also set the frame range for a clip by selecting the bar, double-clicking on the first and last frame numbers next to it, and adjusting them in the x fields that pop up. 1. Right-click anywhere on the Dope Sheet. 2. Select View > Synchronize frame range. 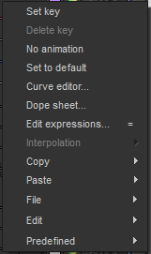 Any changes you now make to the frame range in the Dope Sheet are applied in the Curve Editor too, and any changes you make in the Curve Editor are also reflected in the Dope Sheet. Zooming in and out in either also zooms the other view. TIP: You can also do this by clicking the synchronize button at the bottom of the Dope Sheet. The Curve Editor enables you to edit curves without physically entering information in the Properties pane. 1. Click the animation button next to the parameter whose curve you wish to view. 2. Select Curve Editor. The Curve Editor panel appears with a focus on the selected parameter’s curve. The vertical, or y axis, denotes the value of the parameter. The horizontal, or x axis, denotes time (in frame units). 1. In the parameter tree on the left, click the + and - signs to expand and collapse the hierarchy as necessary. • Hold Ctrl/Cmd and click on individual curves to add them to the selection. 3. To display separate curves for each channel, separate the channels for the relevant control in the node’s properties panel. The parameter tree on the left allows you to focus on any curve in the script. TIP: If you want to view an AudioRead node under your animation curves, you can display it by right-clicking anywhere in the curve editor and selecting View > Audio > Draw Style > Below. For more information on the audio options, see Audio in Nuke. To enable or disable a curve in the Editor, in the parameter tree on the left, click the + and - signs to expand and collapse the hierarchy as necessary. 1. Click on the area you want to zoom in on or out of. Scroll up with the mouse wheel to zoom in, or down to zoom out. TIP: Depending on your mouse preferences, you can zoom to a custom area in the Curve Editor, middle-click on the Editor and drag to select an area with a marquee. When you release the mouse button, the Editor zooms to fit the selected area in the Editor. To pan in the Editor, hold the middle-mouse button and drag over the Editor. You can also use Alt+drag. 1. Right-click on the Curve Editor. 2. From the menu that opens, select View > Frame All. Press A on the Editor. Click the middle-mouse button (dependent on your mouse preferences). Nuke centers the curve in the Editor, resetting the zoom. 1. Select the points you want to center in the editor. 2. Right-click on the Editor, and select View > Frame Selected (or press F on the Editor). Nuke centers the selected portion of the curve in the editor. If no points are selected, Nuke centers the selected curve, or all curves. You edit curves by moving the points on the curve to new locations. If necessary, you can add more points to the curve. You can also sketch curves freely, use the usual editing functions such as copy and paste, smooth curves with filtering, interpolate curves, loop, reverse or negate curves, and use expressions to modify curves. 1. Click on the curve you want to edit. The curve turns yellow to indicate it’s selected. 1. Right-click on the Editor and select Edit > Generate. The Generate keys dialog opens. 2. In the Start at field, enter the first frame you want to use as a keyframe. 3. In the End at field, enter the last frame you want to use as a keyframe. 4. In the Increment field, enter the frame increment you want to use between the first and the last keyframe. For example, if you want every tenth frame to be a keyframe, enter 10. 5. In the last field, enter the value you want to use for y. If you do not enter a value here, the key frames are added to the current curve without modifying the curve shape. • To select individual points, click on the point you want to select. • To select multiple points, Shift+click on the points, or drag a marquee around them. A box is drawn around the points to indicate they have been selected. • To select all points, press Ctrl+A (Mac users press Cmd+A). • To move a point along either the x or y axis only, drag the point to a new location. • To move a point in any direction, Ctrl+drag (Mac users Cmd+drag) the point to a new location. You can also nudge points using the numeric keypad arrows. • To adjust the values of a point numerically, select the point and double-click on the x or y value that appears next to it. 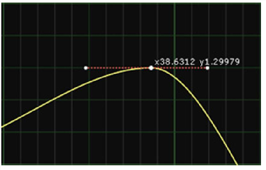 • By default, when you move a point, its position on the x axis is rounded to the nearest integer. To disable this, you can right-click on the Curve Editor and select Edit > Frame Snap. You can also momentarily disable the snapping by pressing Shift while moving a point. • To move several points at the same time, select them and drag the selection box to a new location. To add or remove points to or from the selection box, Shift+click on the points. To resize and scale the selection box, drag its edges. If the selection box is very narrow, you can press Ctrl/Cmd when resizing it. This allows you to resize the box in one dimension only. For example, if you have a box that’s wide on the x axis but flat on the y axis, you can resize it in this way along the x axis. To avoid accidentally moving a point inside the selection box, press Ctrl/Cmd+Shift when dragging the box to hide the points inside the box. 1. Select a point on the curve. Red tangent handles appear on both sides of the point. 2. Drag the tangent handles to a new location. The curve follows the handles. 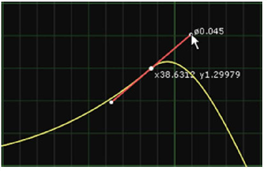 Press Alt+Ctrl+Shift (Mac users press Alt+Cmd+Shift) while drawing a curve on the editor. Nuke sketches a curve that follows your mouse movements. • Edit > Copy > Copy Selected Keys to only copy the points you have currently selected. • Edit > Copy > Copy Curves to copy an entire curve. • Edit > Copy > Copy Expressions to copy the expression that creates the curve. • Edit > Copy > Copy Links to copy a curve and keep its values linked to the original curve, so that if you change the original, your changes also affect the copied curve. 1. Select all the points you want to move. 2. Right-click on the editor and select Edit > Move. The Move Animation Keys dialog opens. 3. In the x and y fields, define how you want to move the points along the x and y axes. For example, to shift the selected points to the right by a value of 10, enter x+10 in the x field. 4. In the slope and left slope fields, define how you want to move the points’ tangent handles. 1. Select the portion of the curve that needs smoothing. 2. Right-click on the editor and select Edit > Filter. The Filter Multiple dialog opens. 3. In the No. of times to filter field, specify how many times you want to filter the curve. Filtering sets new values on each point based on the average values of their neighboring points. The more filtering, the smoother the curve. 1. Select the point(s) between or around which you want to interpolate the curve. • Constant to force a constant value after each selected point. • Linear to use linear interpolation. This produces sharp changes at key frames and straight lines between them. • Smooth to set the tangents’ slopes equal to the slope between the keyframe to the left and the keyframe to the right if the selected point is between these two key frames along the y axis. If the selected point is not between these key frames and has a larger or smaller value than both key frames, the tangents’ slopes are made horizontal. This ensures the resulting curve never exceeds the keyframe value. • Catmull-Rom to set the tangents’ slope equal to the slope between the keyframe to the left and the keyframe to the right regardless of where the selected point is located. The resulting curve can exceed the keyframe values. • Cubic to set the slope so that the second derivative is continuous. This smooths the curve. • Horizontal to make the tangents horizontal, setting the slope around the selected points to zero. • Break to adjust the two tangents of a selected point independent of each other. • Before > Constant or Linear to interpolate the parts of the curve that are on the left side of the first point. This option only works if you have selected the first point on the curve. • After > Constant or Linear to only interpolate the parts of the curve that are on the right side of the last point. This option only works if you have selected the last point on the curve. 1. Right-click on the editor and select Predefined > Loop. The Loop dialogue opens. 2. In the First frame of loop field, enter first frame of the portion you want to repeat throughout the curve. 3. In the Last frame of loop field, enter the last frame of the portion you want to repeat. The shape of the curve between these frames is repeated throughout the rest of the curve. The solid line represents the actual curve, and the dotted line the original curve with the key frames. You can reverse a curve by right-clicking on the editor and select Predefined > Reverse. This makes the curve go backward in time. Both the new curve and the original curve are displayed. The solid line represents the actual curve, and the dotted line contains the key frames that you can modify. You can negate a curve by right-clicking on the editor and select Predefined > Negate. The curve becomes the negative of the key frames. For example, a value of 5 turns into -5. Both the new curve and the original curve are displayed. The solid line represents the actual curve, and the dotted line contains the key frames that you can modify. 2. Click the Revert button to set the field back to previous valid expression. 1. Right-click on the Editor, and select Edit > Edit expression. 2. In the dialog that opens, type the expression you want to use for the curve, for example, sin(x)/x.